Why and how do I use sources for a paper? I need to find a variety of sources. - Ask Us! Q. Why and how do I use sources for a paper? I need to find a variety of sources. Below is a link to a guide that explains how and why a variety of sources is necessary for writing an academic paper. 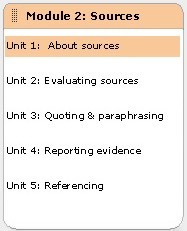 Check out the other modules that include Evaluating, Quoting & Paraphrasing, Reporting Evidence, and Referencing. If you need further information, please Ask Us!